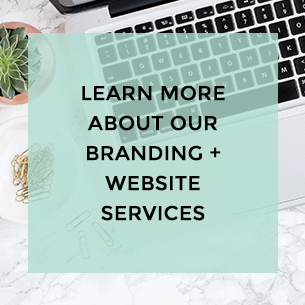 One of the questions I get asked most often when working with a client is “When will my website show up on the first page of Google?” I bet you’ve been asking the same thing. Think of this as a marathon, not a quick sprint to search rank glory. It takes time for your site to get indexed and start showing up in Google’s search results. There are a number of factors that contribute to your website’s ranking on Google and it’s not just about keyword stuffing or backlinks any more. It’s becoming more and more tied to the user experience ­– and for good reason. When users are happy, Google is happy because that means people will continue to use it for their online searching needs. Make it mobile friendly. This is a HUGE one. Whether you’re driving your website or working with a designer, make sure your site is responsively designed. This is just a fancy way of saying your site will automatically format itself based on the user’s device. The good news is if you are working on building a WordPress site, most all new themes have been designed responsively. If you are working with a website designer they should automatically include this in your project. When your site is mobile friendly, visitors have a better user experience and that’s good news for everyone. So what do you do if you have a website built on an older theme that is not mobile friendly? Well, you could create a mobile version of the site, but it would probably make more sense (and cost the same or less) to just redo the site with a responsively designed theme. Not sure if your website is mobile friendly? Use Google’s free Mobile-Friendly Test to check. Make it load faster. Have you ever landed on a website and patiently waited for the images to load? Yea…we’ve all been there. Guess what? Google doesn’t like it. And, frankly, neither do your site visitors. According to surveys done by Akamai and Gomez.com, nearly half of Web users expect a site to load in 2 seconds or less. In fact, they tend to abandon a site that isn’t loaded within 3 seconds. Yikes. So how does one go about making their website faster? The most obvious way to improve site load time is by compressing the file sizes of all your images. I see this a lot. Business owners get professional headshots and branding photographs for their site, and they simply upload the images they receive from the photographer. Y’all, don’t do this! Your photographer is sending you (or they should be) hi-resolution, print quality images. Those babies are BIG, we’re talking like 5 megabytes and up. Please, please reduce the file size before you hit the upload button. You can easily do this by using something free like Tiny PNG or resizing the images in Adobe Photoshop. WANT TO LEARN HOW TO MAKE YOUR WEBSITE LIGHTNING FAST? DOWNLOAD THE FREE RESOURCE 4 WAYS TO MAKE YOUR WEBSITE FASTER. Make it full of awesome content. You’re probably wondering why I haven’t mentioned keywords yet. I’ll tell you why. 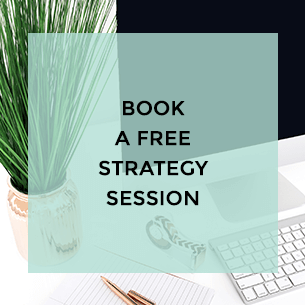 You can stuff keywords all day long, but if you don’t have quality content that corresponds with those keywords, then you’re doing your website a disservice. Remember when we talked about making users happy? Well, Google knows when you do and don’t provide unique, quality content to visitors – and when you don’t, they’ll serve up someone else’s site that does. That doesn’t necessarily mean that you should go build out 20 pages and slap some copy on them. In fact, that’s the last thing I want you to do (read more about 5 things every small business website needs here). It means that you should be optimizing every piece of content currently on your site. If you have a WordPress site, an easy way to do this is by using the free version of the Yoast SEO plugin – it’s my favorite search engine optimization plugin and is super easy to use. You should be optimizing keywords, meta descriptions, titles, and improving readability, which can be done by including bullets, paragraph breaks, sub headers, images and links. And if you have a blog, you should be doing all of those things for each post. This is by no means a comprehensive list of things you can do to improve your Google search ranking, but it’s a great start. Have specific questions about your website? Send me a message; I’d be happy to take a look. READY TO SPEED UP YOUR WEBSITE SO THAT VISITORS STICK AROUND? 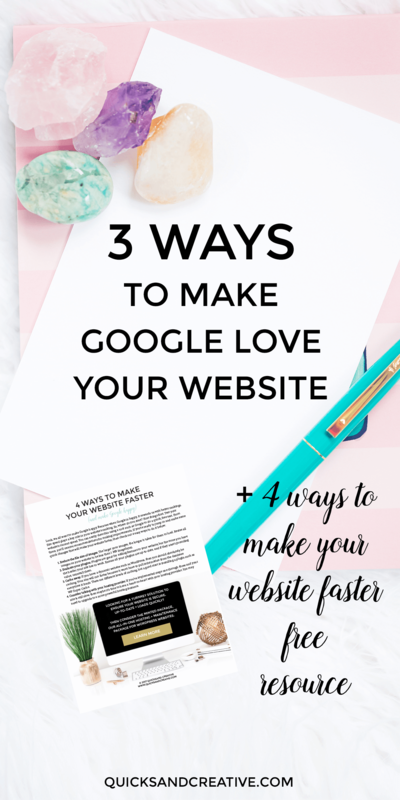 GRAB THE FREE RESOURCE 4 WAYS TO MAKE YOUR WEBSITE FASTER. So helpful Jen! Thanks for sharing!! You are so welcome, Eveline. Thank you for stopping by! Hi, I'm Jen. 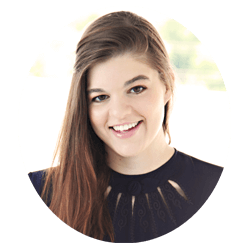 A mama, brand strategists + website designer who loves helping small biz entrepreneurs live their passion.